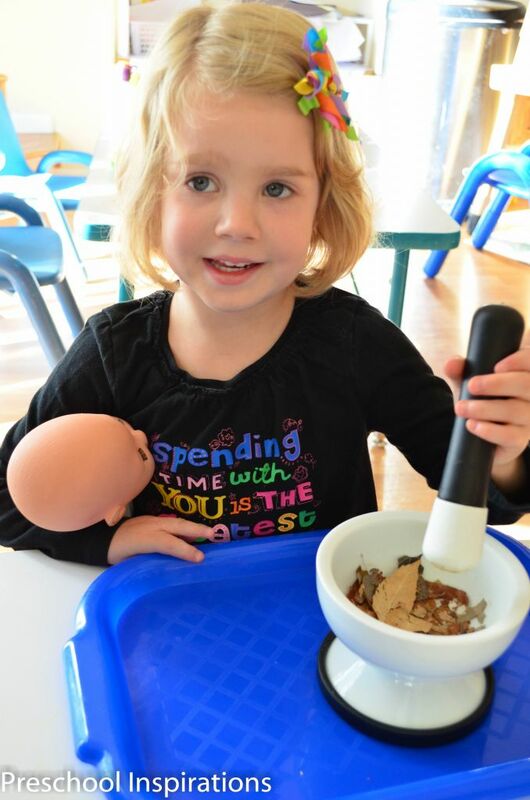 We have “Montessori Thursdays” at my in home preschool, and I look forward to them EVERY week. This is my first school year implementing Montessori practical life activities, and I wish I had started doing this years ago! The life skills that are learned in Montessori activities are so valuable, and I am looking forward to integrating more Montessori philosophies into every day of the school week. Here is an activity that just involves popcorn seeds and a scoop. We are using a coffee scoop, although any scoop of similar size would work. 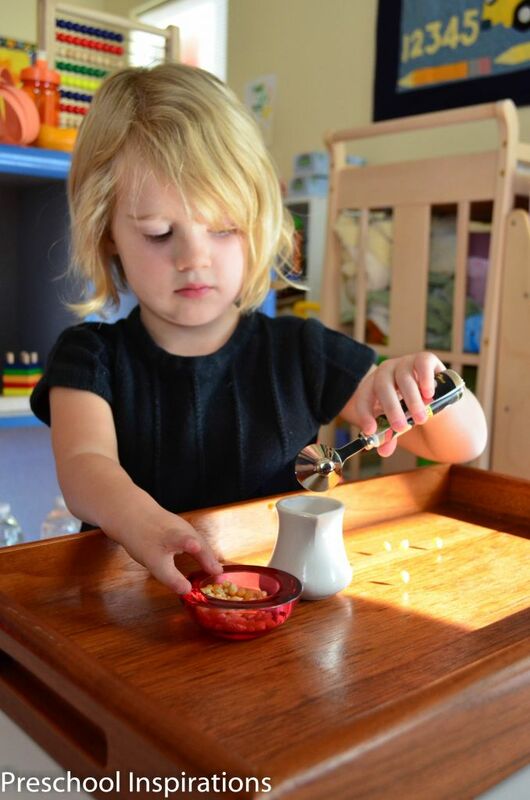 In this activity, the child scoops the seeds from the ramekin into the pitcher. Then they pour it back into the ramekin. I loved the simplicity of this activity and that even in my mixed age group (2.5 to 5 year olds), each child wanted to participate in this activity. 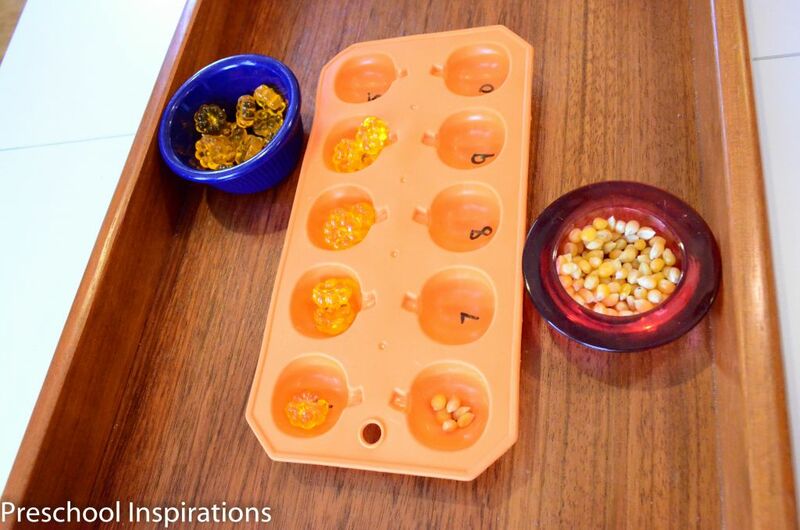 Next, I took a pumpkin ice cube tray (that I found at the dollar store) to make a math activity. I numbered it from 1-10 with a dry erase marker. You could write the numbers on a piece of scotch tape and put them in instead of actually writing on the ice cube tray. I put pumpkin jewels (also from the dollar store) in one ramekin next to the numbers 1-5, and I put a ramekin of popcorn seeds next to numbers 6-10. The child simply counts and fills the correct number of pumpkins or popcorn seeds into the numbered slot. The pumpkins start overflowing after there are five, so it is a good sign to the child that they need to use the popcorn seeds instead. I also like that the popcorn seeds were slightly more difficult to pick up because then the children who breezed through the pumpkins found the popcorn seeds to be more of a challenge. This has been a great math activity, and it really helps children conceptualize one to one correspondence. Lastly, we used a mortar and pestle to crush some leaves. Earlier in the week, my husband and daughter were grinding up dried basil with it, and since I didn’t have enough of that to go around, I thought leaves would be the perfect solution for a class setting. I found leaves that had fallen off the tree about a week ago, and they were perfect to grind. It takes some persistence to get the leaves fully ground up, but that is part of the beauty in it. It is a developmentally appropriate way to teach patience, and at the same time, a huge sense of accomplishment is developed. We look forward to delving into the Montessori world more, and I will continue to add more of our favorite activities. 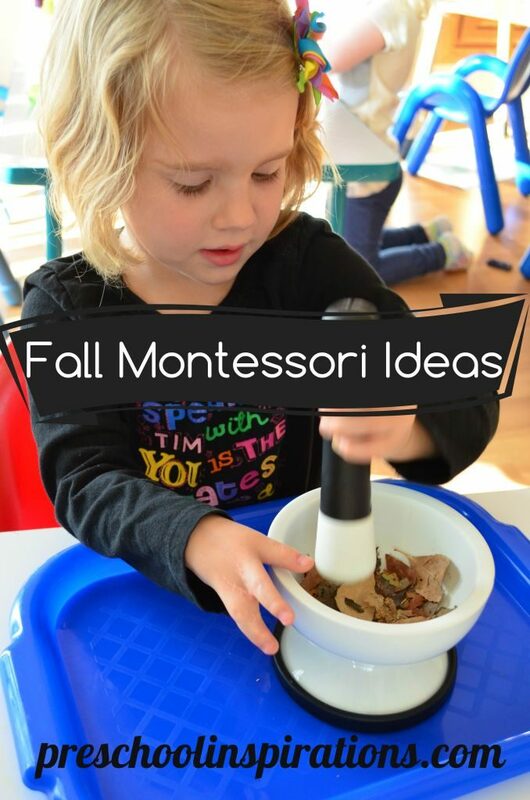 To see some other great fall Montessori activities, I highly recommend visiting Living Montessori Now! Love the post. Learning and fun combined! I love the idea of working with a mortar and pestle. It has been so much fun JDaniel4’s Mom! We have been using it with other herbs too. It’s such a pleasure to have you visit!